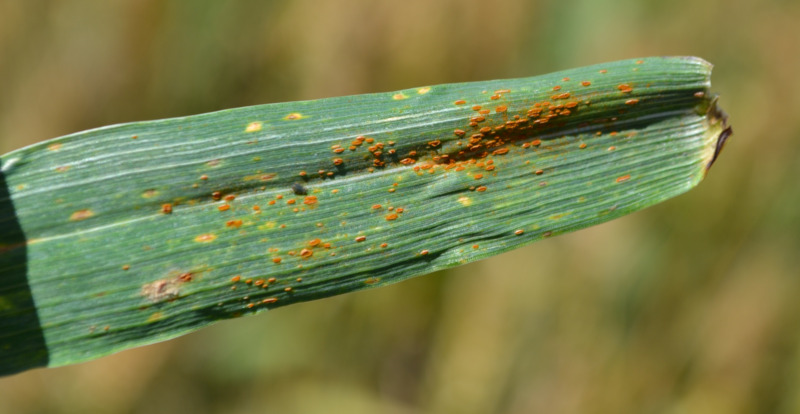 This page provides information about known wheat leaf rust pathotypes in Western Australia (WA), including most recent incursions in 2013 and 2015. In the presence of new pathotypes, wheat varieties can have their disease resistance rating for leaf rust shifted towards greater susceptibility. As a result, disease management of these varieties will need to change, particularly in leaf rust prone areas. Growers and agronomists are encouraged to submit samples of any leaf rust finds to the Australian Cereal Rust Control Program for pathotype testing. In the past 25 years, since 1990, nine leaf rust pathotypes have been identified in Western Australia (WA) (Table 1). The dominant pathotypes over the last ten years have been stable and wheat variety leaf rust rankings have not changed significantly in that time. Over that period, statewide leaf rust epidemics occurred in WA in 1992 and in 1999. Smaller regional outbreaks of leaf rust have developed regularly over that period. In 2013, a new leaf rust pathotype to WA was detected which was the first occurrence of virulence for the resistance genes Lr13, Lr17a, Lr17b, and Lr26 in WA. As a result wheat varieties dependent on these resistance genes are now more vulnerable to leaf rust infection by this strain. The new pathotype was first detected in wheat crops in eastern Australia in 2011 and is presumed to have entered WA on prevailing winds or someone’s clothing. In the spring of 2013, this new pathotype was identified in crops from Northampton to Esperance on a range of varieties showing unusually high levels of leaf rust, including Mace and Wyalkatchem. Until 2013, Mace and Wyalkatchem had demonstrated effective resistance to leaf rust in WA. Since that time, this pathotype has established across the WA wheatbelt. In 2015, another new leaf rust pathotype to WA was detected in the northern wheatbelt and it is expected to become the dominant pathotype across the wheatbelt. The new pathotype differs from those detected previously in WA in being fully virulent on the complementary resistance genes Lr27+Lr31, the adult plant resistance gene Lr12, and in combining virulence for Lr1 with Lr13, Lr17a, and Lr26. As a result wheat varieties dependent on these resistance genes are now more vulnerable to leaf rust infection by this strain. A radio interview with Professor Robert Park from ACRCP about the detection of this new leaf rust pathotype can be heard online through the ABC site. This pathotype was first detected in South Australia in August 2014, and has since spread throughout much of the eastern Australian wheat belt. It is presumed to have entered WA on prevailing winds or someone’s clothing. It is expected that this pathotype will quickly spread to be the dominant wheat leaf rust pathotype in WA. This is only the third example of a wheat rust isolate migrating from eastern Australia to WA in the past 25 years, all being wheat leaf rust: an isolate of pathotype 104-1,2,3,(6),(7),11 was first found at Salmon Gums in 1990; in 2013, an isolate of pathotype 76-1,3,5,7,9,10,12 +Lr37 was found at Esperance. Table 1. Known wheat leaf rust pathotypes in WA (Source:Dr Robert Park, Australian Cereal Rust Control Program). Pathotype naming is a complicated system that does not relate to genes but to the rust response of four wheat genotypes that permit a standard race designation, and an additional 11 wheats used as Australian supplementary differentials. What changes are there in wheat variety ratings to leaf rust? Wheat varieties dependent on the resistance genes which are no longer effective are now expected to be more vulnerable to leaf rust infection by these strains. After the 2013 pathotype incursion Several variety rankings changed, these included Mace, Wyalkatchem and Corack, Bonnie Rock, Emu Rock, Tammarin Rock, Halberd, Binnu,Yitpi, Arrino and to a lesser degree Fortune, Zippy and King Rock. After the 2015 pathotype incursion there were further changes: Arrino, Binnu, Emu Rock, Envoy, Estoc, Grenade CL Plus, Mace, Tammarin Rock, and Zippy became rated more vulnerable to leaf rust, if infected by this pathotype. The changes to wheat variety ratings since both incursions are reflected in the current wheat variety guide. See wheat variety resistance ratings. At any time, variety disease rankings reflect the dominant pathotype. The Australian Cereal Rust Control Program (ACRCP) continuing to conduct testing in order to keep us up to date with the potential impact of these new pathotypes on WA wheat varieties. Is it known where the recent new pathotypes have come from? What should grain growers do now?